Sprouted Kala Chana Masala / Chana Palak Curry / How to make Sprouts at home ? 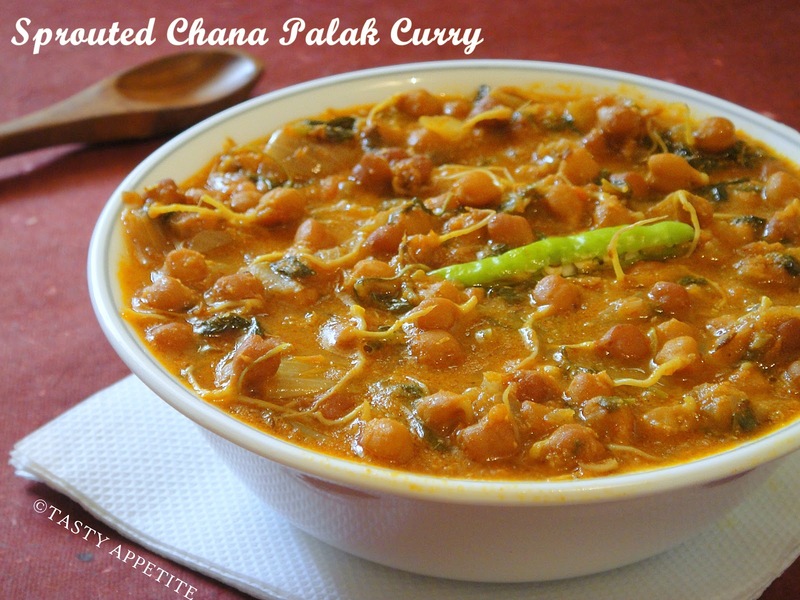 Chana Palak Curry is a filling & healthy Indian recipe. 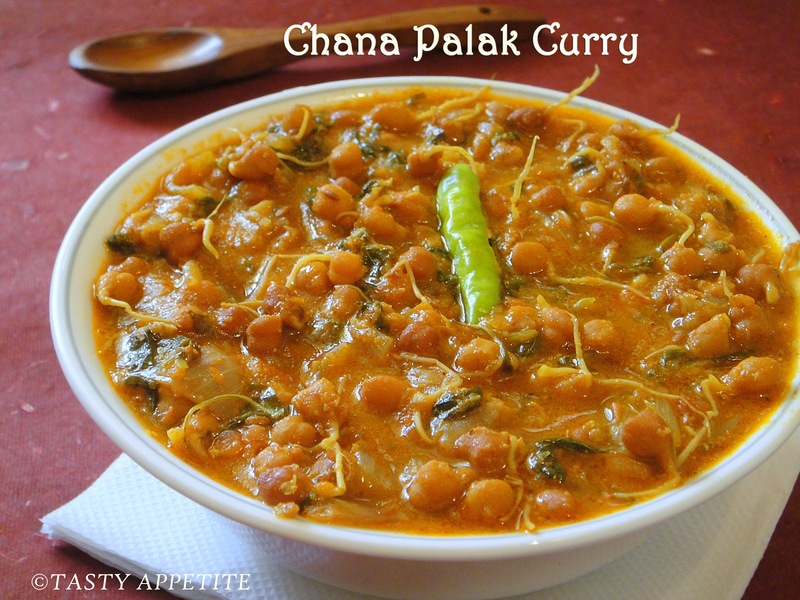 The unusual combination of Chana and Palak makes this dish exotic. This flavorful curry made from sprouted black chickpeas, will tickle your taste buds as well as keep your blood sugar levels under control. We know Sprouts are very rich in vitamins, proteins, amino acids, digestible energy and phytochemicals. Lets see how to make sprouts easily. 1. Wash and soak chana overnight or atleast 8 to 12 hrs. 4. Take a clean washed light cloth and wet it. 5. Keep all the chana in the cloth and wrap it loose. 7. 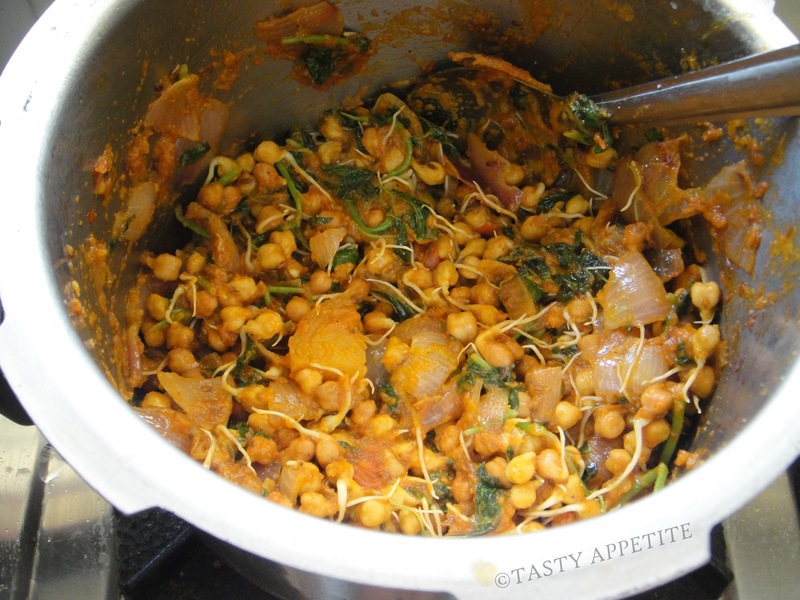 Keep wrapped till next day morning, you can see fresh little sprouts readily appearing on the chana. 8. If you want to get bigger & thicker sprouts, rinse and drain for every 8 to 12 hrs for 3 to 4 days. 9. Take care not to disturb the sprouts while rinsing. They should stay firm inside the cloth. 1. Heat oil in a pressure cooker or pan. 2. Add cumin seeds and wait to splutter. 3. 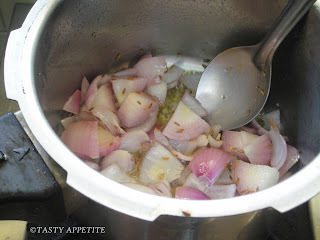 Add finely chopped onion and cook for few minutes on medium heat stirring occasionally , until onions are transculent. 4. Add sliced green chilly, ginger garlic paste and sauté for a minute. 5. 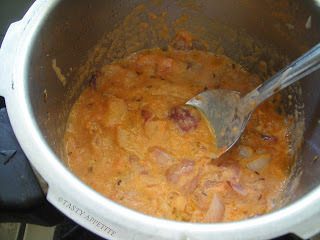 Add the mashed tomatoes and cook for another 2 to 3 minutes until oil separates. 6. 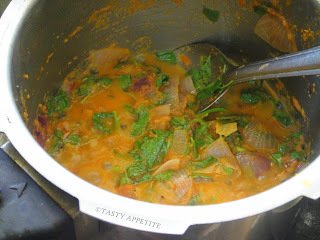 Now add chopped spinach / palak and mix well. 7. 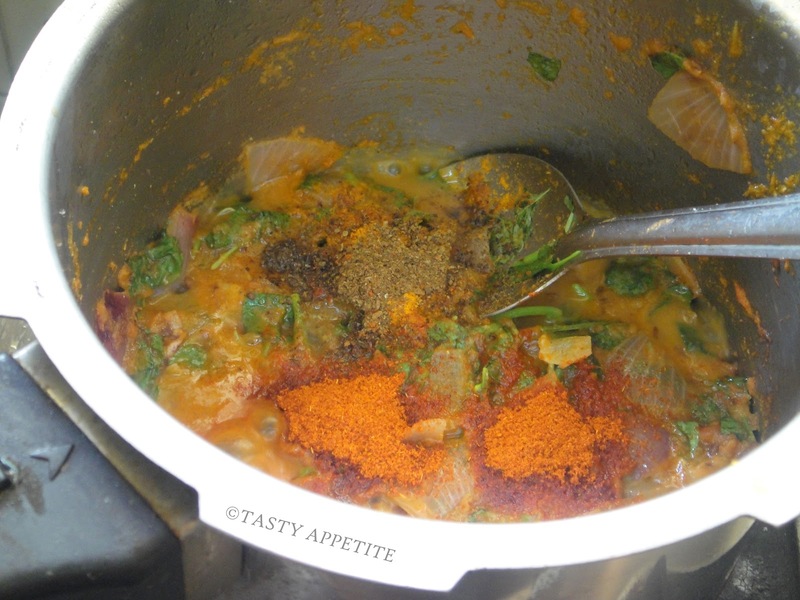 Add red chilly pwd, salt, turmeric pwd, garam masala pwd, cumin pwd and coriander pwd. 8. Mix for a few seconds. 9. Add sprouted chana and combine. 10.Now add yoghurt and mix. 11.Add 3 cups of water. 12.Taste & adjust salt and seasonings. 13.Pressure cook on medium flame for 2 whistles and then on low-medium heat for 2 to 3 whisltes. 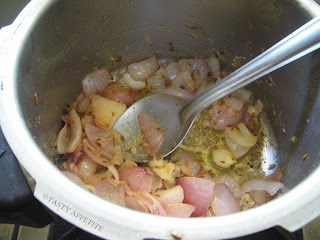 14.Mix well and add few drops of lemon juice. 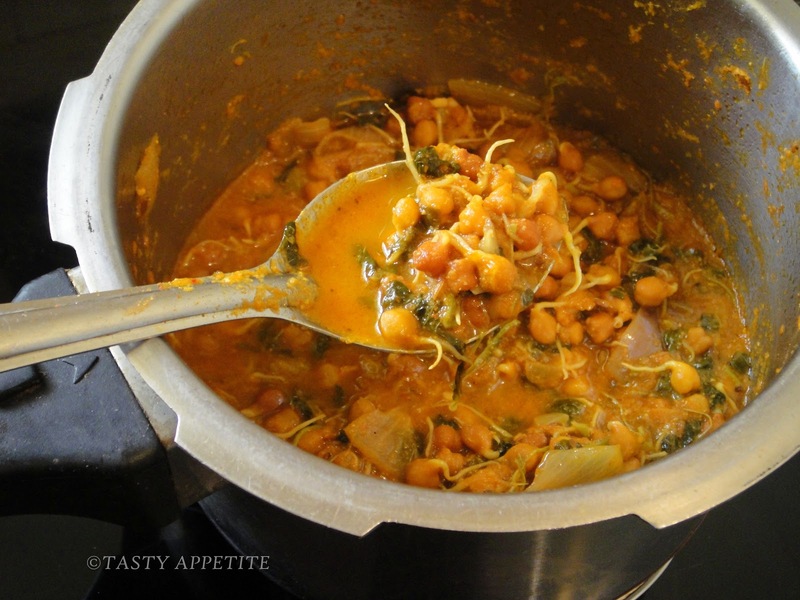 15.Healthy & nutritious Sprouted Chana Palak curry is ready. 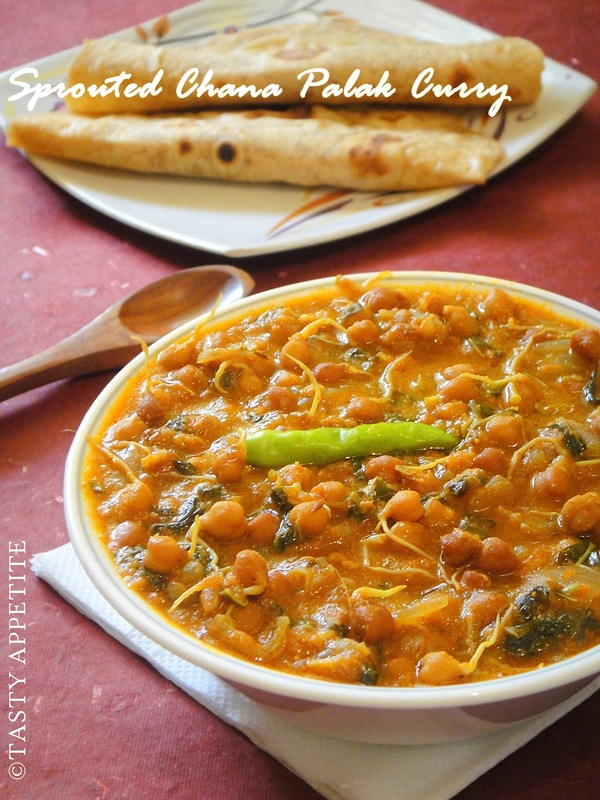 16.Serve hot garnished with cilantro with roti, chapatti or rice. · The same curry can be prepared with the kala chana soaked overnight as well. 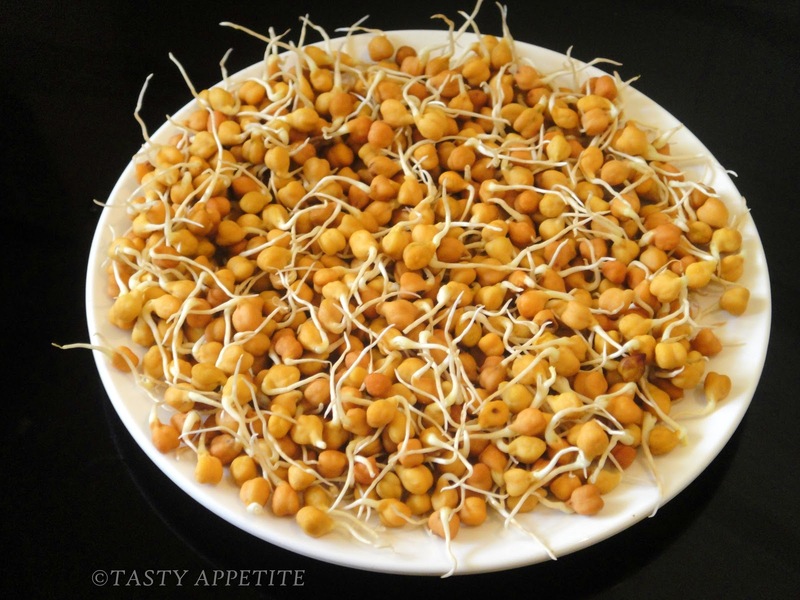 · Sprouted chana are softer and already more edible, so they can take less cooking time. Looks superb and a healthy masala. Nice tasty and healthy curry !! perfect with rotis !! Wish you and your family a Happy New Year !! I simply love recipes with sprouts. Good one jay !! Very healthy curry.love the pics. 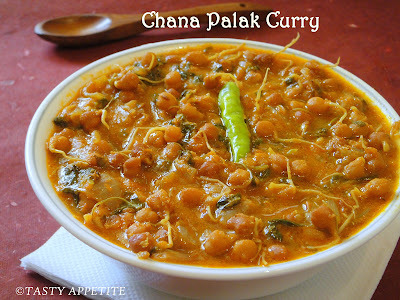 Nutritious and super healthy channa masala, loving it. 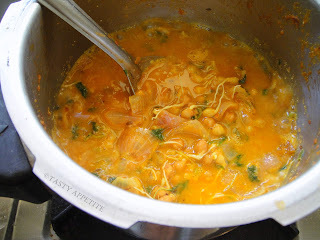 Very healthy curry n useful post!!! What a tasty and delicious curry! 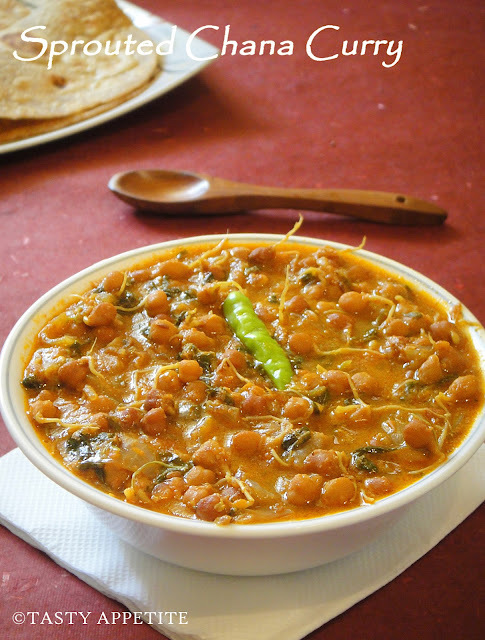 hi jay, one thing for sure is that i learnt a lot about peas from indian cooking- especially in your blog here. this one looks very delicious and i simply like spinach too. will try this and eat with roti. that is so healthy and so flavorful!!!! Sprouts are really great in any form. I loved this recipe and I have all the ingredients ready for cooking it very soon. Wish you a wonderful year ahead. tasty curry and well explained.. 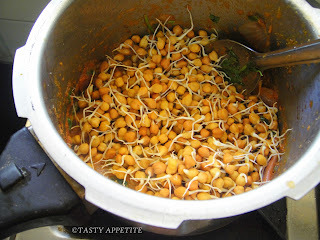 I make it in the same way but with green moong sprouts !!! I have sprouts salad and curries a lot. like this version as well! 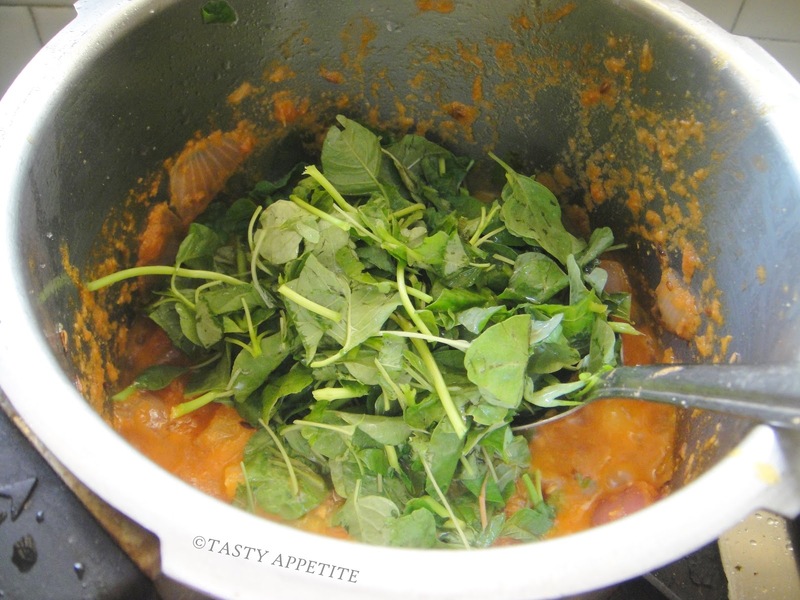 such an healthy gravy..looks tangy..
Super healthy curry,love the addition of spinach!! awesome sprouts and lovely clicks.. Healthy and delicious curry.. Very inviting..
Curry looks so healthy and tasty..
Lovely and nutritious dish. Looks really mouth watering. 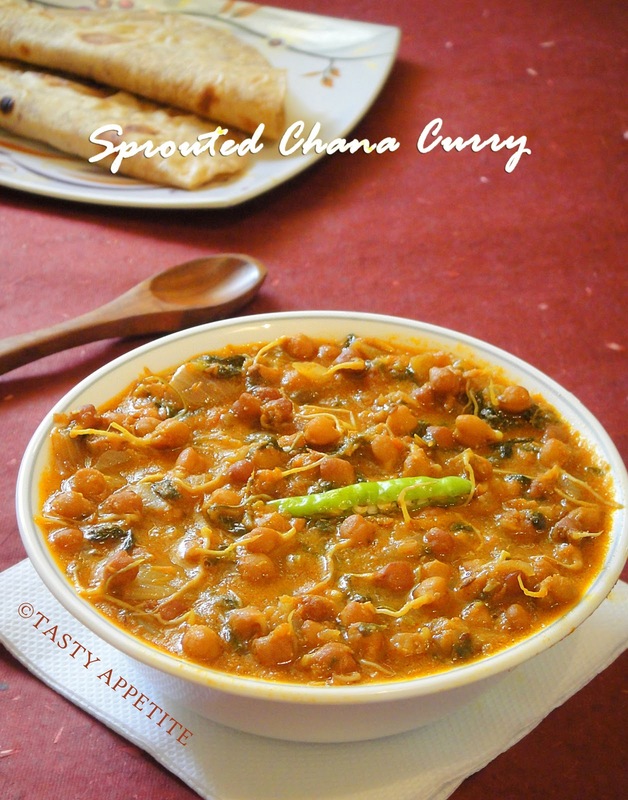 Lovely...Perfect cooking...I never seen the stem of the sprout after cooking..Nice job..
Wow super tempting and healthy curry.. It's been years, Jay, since I sprouted anything, never chic peas. Hmm, food for thought. Very delicious vege curry. I like the idea of putting sprouted chickpeas in it. So healthy channa sprouts. SO healthy. Healthy curry..Loved the addition of palak..Happy new year to u Jay! Very healthy ! And Jay, your pics are always so crisp and clear. Love them. Love the idea of using sprouted channa,sounds delicious and healthy. Hi Jay, your chana curry look awesome. Thanks for sharing the sprouts, very interesting.